Foot pain can often linger and become a chronic injury. Prevention is a must for all runners before you get injured. These tips will help you prevent AND fix foot injuries. 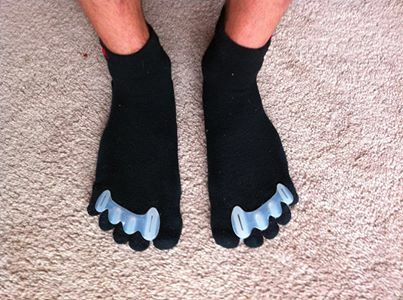 Wear Correct Toes to renew, align and strengthen your feet. Wear Altra shoes which allow your feet to spread and move naturally. Follow a Wholicious Living nutritional lifestyle to reduce inflammation and pain and speed up the healing process. Learn low impact, efficient and pain-free running and walking technique. It’s amazing how many people I’ve helped with a couple simple exercises. -Damian Stoy is a professional ultra marathon runner, founder of Wholistic Running, biomechanics specialist, running coach and has been injury-free for over 10 years. To receive more tips from Damian, sign up for our free emails HERE. This entry was posted in online running coach and tagged bunion, feet, foot, injuries, injury, natural, neuroma, plantar fasciitis, run, Running, stress, toes by Wholistic Running. Bookmark the permalink.